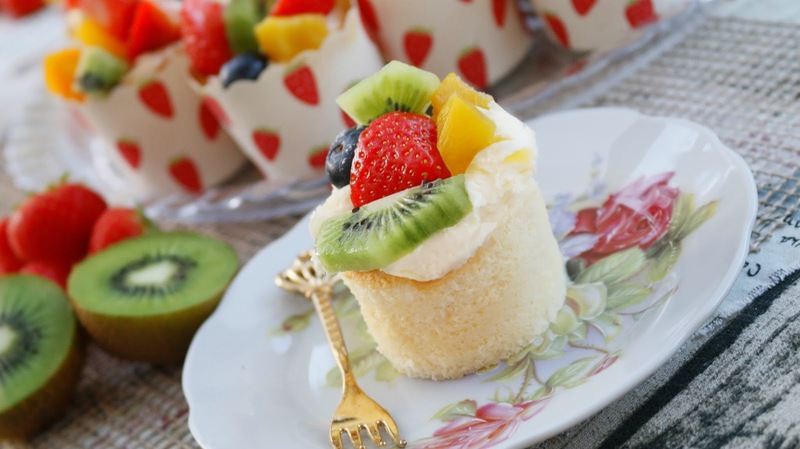 This is a yummy whipped cream cupcakes topped with fresh fruits and that turned out to be one of the best cupcakes I ever tasted. Cake toppers aren't always required. It's delicious, melt-in your mouth goodness and buttery flavored, also made using the cooked dough method. 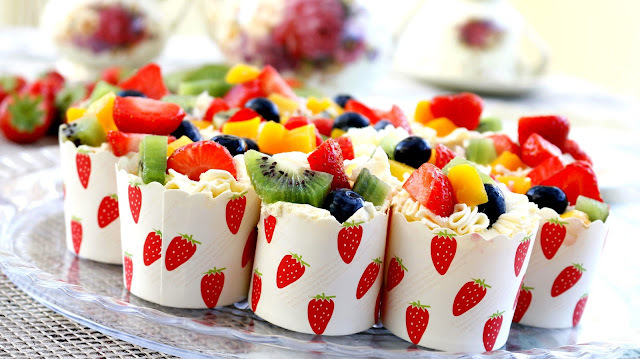 I believe you can make so much better than the store bought bakery and make this looks as gorgeus into a special treat or make a birthday really special. You will need 20 cupcake baking cups 5.5cm x 4.5cm / 2.2'' x 1.7''. 1) In a saucepan, heat the butter, over medium low heat, turn it off if the oil starting to bubbles. add milk and sugar, stir until melted. Add the eggs one at a time and and beat for 5 seconds, add a pinch of sea salt and sift in the cake flour and whisk until smooth. 3) Strain the cooked dough through a large strainer for extra smooth. Gently fold until the whites and yolk mixture to incorporated. be careful do not over mix if not your cake won't rise. 4) Pour the mixture into 20 baking cups 5.5cm x 4.5cm / 2.2'' x 1.7''. Bang the pan 2-3 times to remove any air bubbles. 5) Without a hot water bath, Fan oven 150°C bake for 25 minutes, or until cake tests done. Leave to cool in the oven with the door open, for at least 5 minutes and remove the cake from oven and bang your pan again, prevent it from shrinking when it cools down. 6) Use a sharp knife to peel (C) and cut the mango and kiwi into chunks. gently rinse the stawberries and blueberries under cold water, drain immediately. Cut any shape you want. Refrigerate until ready to use. 7) In the meantime, whip the (D) double cream until can hold a stiff peak, about 4 minutes. Do not over beat. Refrigerate it, before using if needed. 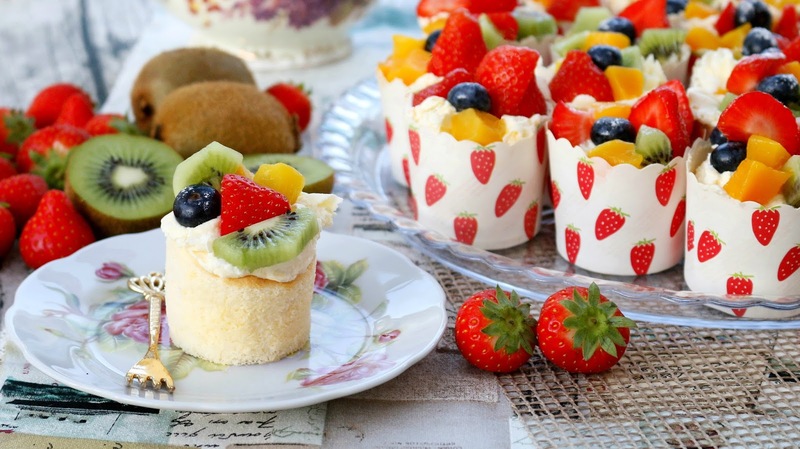 8) Spread whipped cream on cake top and decorate with fresh fruits and sprinkle the sanding sugar over the tops. Transfer the cupcakes to a plate for serving. Any leftover cake can be covered and kept in the fridge for overnight. 1) Be careful not to open the oven during the baking process. 2) Over mixing cake batter can result in a heavy, sinking fast, closed to rubbery texture. 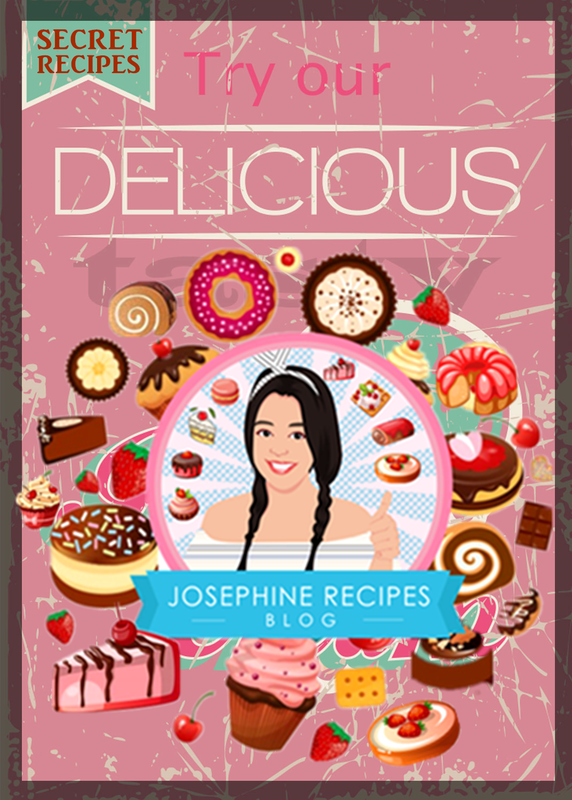 3) Cut a path down and don't stir and never use an electric mixer for mixing. 4) Cakes shrink or wet if they're not baked thoroughly. 5) I used cold eggs in most of my cake recipes. 6) Place egg whites in a clean, dry bowl, completely free from any grease, oil or water. Beating egg whites is a very important process, It will help your cakes rise with perfectly. 7) Do not under or over beat the egg whites. As soon as the white have reached to stiff peak stage and fold them into your batter and bake immediately. 8) Do not bake the cake quickly at a high temperature and don't remove hot cake out of a baking pan. otherwise the cake could deflated, shrinks or crack on top. 9) Please understand that everyone's oven work differently. You should also check the temperature of your oven. if not, your cake won't rise well. 10) Do you have a favorite brand of butter? Yes, Kerrygold Salted Butter and Tesco British Butter.